Monday morning began with two less-­than-­pleasant visits to dentists— one in Encino to remove my temporary bridge in preparation for the other doctor in Beverly Hills to “open up” the six implants I had a few months earlier. Like a fool I accepted a movie session for that afternoon. I was in quite a lot of head pain for the first part of the session but it got better. It was a brass overdub session for Ramir Djwadi at Sony for the film “Pacific Rim”. Luckily it was easy stuff to play. I was joined by Gary Hickman and we both played tubas and cimbassos. It was the 1st of four different movies this week. 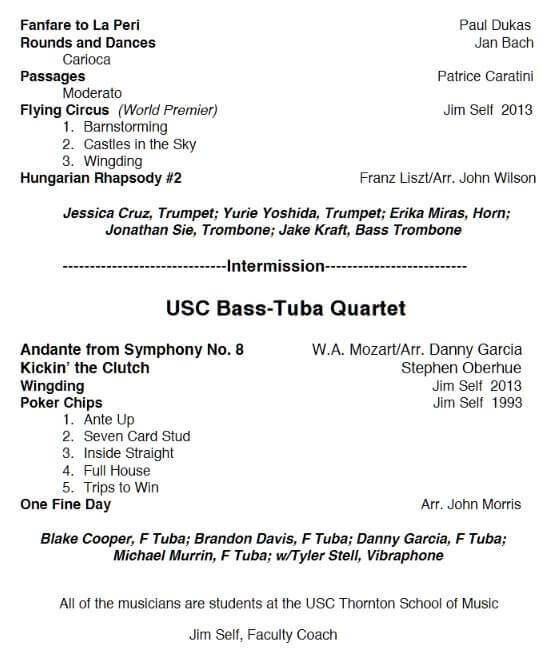 Then I went over to USC and coached my quintet in preparation for their upcoming concerts—they played great. At this time of the school year it is especially fun to work with my students—a whole year of hard work comes down to final concerts and recitals and they rise to the challenge. Then Norm Pearson and I judged our biannual Mock Symphony Tuba Audition where all six USC tuba students competed. They did a good job. The winner this semester was Danny Garcia and Blake Cooper was runner up. We followed that with an intense rehearsal on the music we are playing next week at the Southwest Regional Tuba Euphonium Conference. At 11 PM I finally got to go home—a very tired puppy. Tuesday I had the morning free at home to do email, edit the Cunliffe Tuba Concerto and catch up on a lot of business. The afternoon was another movie call. This one, at the Bridge Studio, in Glendale, was for talented young composer, Jeremy Tisser called “Valiant”. He wrote some great tuba solos and it was a fun session. Wednesday morning I went over to Conway studios in Hollywood to do a session for the movie “Planes”. The composer was Mark Mancina. It was a small German Band with just tuba, trumpet, accordion, drums and guitar. We played several neat songs for the movie and the tuba was really prominent. That afternoon it was to Warner Bros. Studio in Burbank for a session on the movie “We’re the Millers” with composer Teddy Shapiro—on tuba and cimbasso. Thursday morning I played a rehearsal at the Union with the David Angel jazz band—on bass trombone and tuba. This is one of the most interesting things I do. His music is jazz chamber music at it’s best. The group is 2 trumpets, horn, trombone, tuba/bass bone. 5 saxes/woodwinds, guitar, bass and drums. In the afternoon I drove do to the Pacific Symphony for the rehearsal and 1st concert of the pops program. I really lucked out and only had to play the “classical” 1st half (and not the Gladys Knight’s portion) which means I got home earlier. All afternoon on Friday we held auditions at Disney Hall for the 2nd Trombone position in the Hollywood Bowl Orchestra. Alex Iles won the job with an almost flawless audition. Then back to the Pacific Symphony. Saturday was mostly spent preparing for our annual “Live at Basset Hall 7” concert for Sunday. This is something Jamie and I do each year to have my USC chamber groups play in our big music room and Jamie prepares great food. That night I went again to Orange County for the last Pacific Symphony concert in the series. I am thrilled at this age to be so active and into so many interesting things (movies, symphony, playing several instruments, jazz, composing, teaching) and to have it all come together in one week. I say it again, “I am a lucky guy”.